Intellihub editor-in-chief Shepard Ambellas tediously went through 518 different 911 calls from the night of the 1 October massacre in which the online sleuth located a cornucopia of information which further paints a picture of how Las Vegas Metropolitan Police Department Sheriff Joseph Lombardo lied to the general public about events which occurred on the night of the shooting. However, it’s also important to point out that the sheriff did not lie by choice but rather lied due to the fact that the Department of Homeland Security deemed the terror attack a ‘matter of national security’ just one day after the shooting which is why FBI Special Agent Aaron Rouse was subsequently assigned to Lombardo as his handler. The following calls to 911 took place between the hours of 10:00 pm and 11:59 pm on October 1, 2017, and absolutely eviscerate LVMPD’s narrative of a single lone wolf shooter. You can read over 250 other detailed reports on the Las Vegas Shooting here. When a 911 operator asked the caller if she saw the shooter, the woman who was inside the Route 91 venue at the time replied: “I think we saw the guy flying in a helicopter. […] You guys need officers in the sky because he’s flying in a helicopter.” (Keep in mind the LVMPD helicopter did not show up anywhere near the vicinity until 10:25 pm) You can learn more about the helicopters here. A man who got a call from one of his employees saying that she was ‘trapped in an airport hanger’ relayed the information to a 911 operator. “Okay, she’s in a hanger at an airport and she said that she’s seen people get shot there where she is. She said that she’s at an airport and they broke into, and ducked into a hanger [she] thinks it’s hanger number six and [said] there was shooting going on where she is,” the man explained. “Two [middle-eastern] gentlemen with backpacks and a bullet proof vest walking calmly into the hotel while everybody is running the other way, and they got people who were shot in the restaurant in front of it. I think that’s some of the shooters. It’s behind the Hooters. It’s America’s Best Value — it’s a little motel,” a man told 911. “There is more than one shooter […] I want you to know there is more than one. […] There’s multiple. […] Stop telling the news that there is only one shooter there is multiple shooters and they are out there,” a woman who was being adamant told 911. The woman was at the MGM Grand. Woman reports to 911 that there was a shooter inside the Paris casino and that multiple shots were fired. “I think I heard five to six shots, boom, boom, boom, boom, boom,” the woman explained to the operator. 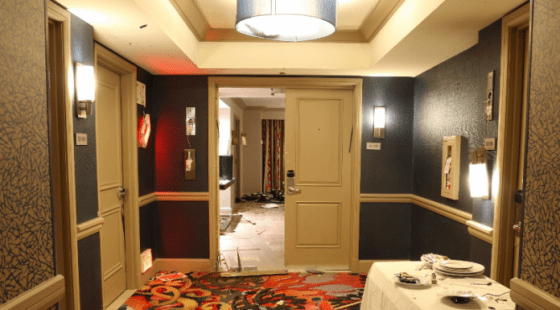 A hotel guest staying on the 21st-floor at Mandalay Bay told a 911 operator that he heard “what sounded like an explosion” around 11:30 pm just before “glass” fell down past his exterior hotel room window. A woman who called 911 told the operator that her sister was in the food court at the Excalibur when a gunman came in and open fired. A guest staying at Mandalay Bay on the 33rd-floor reports hearing an explosion below the 33rd-floor. Caller to 911 operator: “So there is this active shooting guy at the Mirage.” (Caller references a male shooter inside of the Mirage). A man staying at MGM Grand on the 38th-floor in tower number two room 37-716 reports hearing a lot of gunfire in the building within the past 2-3 minutes. A man named Chris told a 911 operator that he sees a man dressed in black on the lower roof of the Mandalay Bay by a skylight. 911 caller reports that a lot of shots were fired in Caesar’s Palace around 11:33 pm. “One woman even got shot,” he explained.